This space was formed in 1982, when the choir loft above was extended. The glass doors and partition were installed to make a welcoming area, separated from the nave of the church. 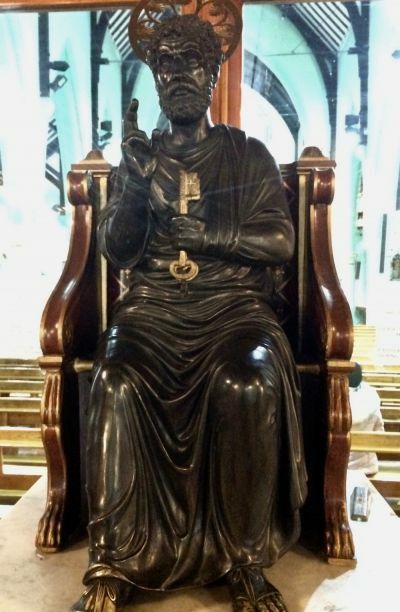 Dated1878, one of many made by E Balmes in Rome around this time, in imitation of the much larger 13th century bronze figure in St Peter’s Basilica in the Vatican, whose foot has been eroded by the touch of pilgrims. Pugin’s design proudly displays the massive hinges and other fittings. Some architects would hide them in the door for the sake of neatness, just as our 1982 architect hid the hinges on the glass doors into the nave. Pugin believed that a building should show how it works, as buildings did in the 13th and 14th centuries. 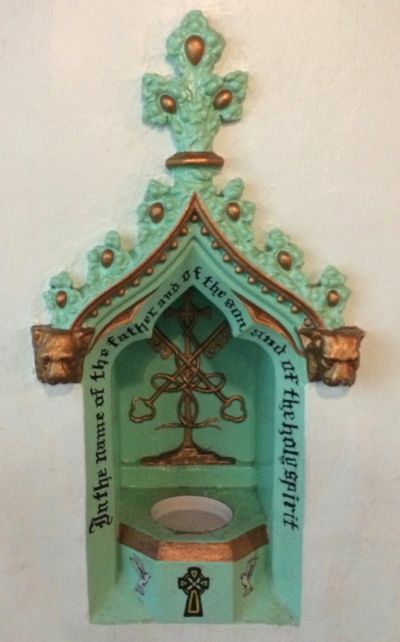 The water stoup is Pugin’s design. Originally undecorated, it was painted by a parishioner in the 1990s. The water is intended to be used to invoke a blessing, by dipping the tips of three fingers and making the sign of the cross as a reminder of baptism. 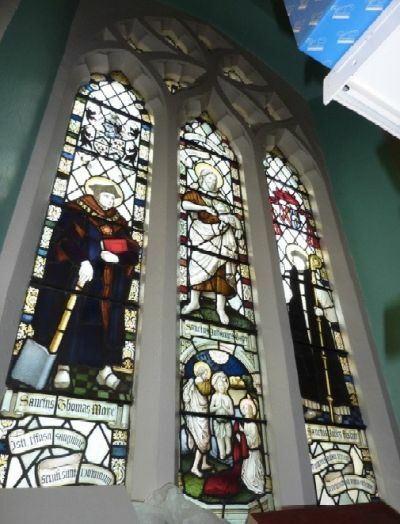 This stained glass window in the west wall is now within the shop, so not normally accessible to visitors. It shows Saints Thomas More and John Fisher, the Good Shepherd and the Baptism of Christ. This window provided light for the baptismal font, located here until it was moved to be near the sanctuary in the 1980s. In May 2016, Chapel Studio (Robert Holloway) attributed the glass to Charles Eamer Kempe on stylistic grounds, no maker’s mark being found. This would suggest a date in the 1890s.